Perfection, or at least its more sublime cousin, the aspiration to it, is found in Sukiyabashi Jiro, a small, ten-seat restaurant with no toilet that is buried on the ground floor of an office building near a Ginza subway station in Tokyo. There, Jiro Ono, his eldest son, and many a reverent but haggard apprentice (some of whom have to endure ten years or more of learning how to properly fold a hot towel before being even allowed near the eggs or nori) devote their lives to one thing: the daily, rigid-but-artistic routine of producing some of the greatest sushi in the world. Some would say that they make the greatest sushi one will find, and that Ono is the premier sushi chef in the world. 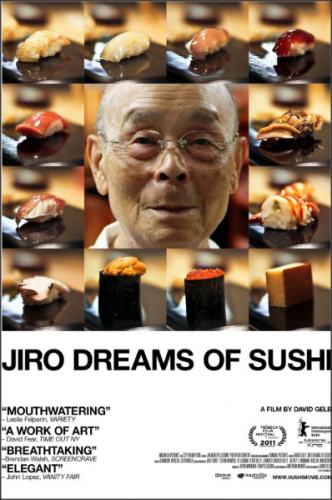 Jiro Dreams of Sushi is reverent and generally agrees with that assessment of the man and his work, though enough of the all-too-human poignantly bleeds through to give us a guarded, but occasionally revealing look at the glories and costs of being a Shokunin, a master artisan and craftsman with singular focus. In the few brief conversations that do not revolve around sushi or the restaurant, Jiro reflects on his absent father, who taught him that life was about making it or, if you fail, having nowhere to return. This idea of endurance or disgrace was passed on to his sons. It is implied that he was not home much when they were growing up and that he expected them to become artisans with as single a devotion to craft as him. It is also apparent that the nest was closed should they come up short. The elder son is expected to follow in his father’s footsteps, so while the younger set out to start his own place, the elder son has served as an apprentice with Jiro for almost fifty years. It is not known if either son has a family, or if they too subscribe to Ono’s success-or-bust style of parenting. In any event, they clearly revere him and put a lot of pressure on themselves to continue the business and the obsessive drive for perfection. Director David Gelb is understated in his approach, to say the least. For the most part, he keeps to a straight-forward style, with a focus on the cleanliness and almost casual elegance of the daily routine, with some nice slow motion to emphasize that grace. In most interviews, including those with vendors and patrons, Gelb lingers a few seconds after responses, catching unguarded glances, awkwardness or happiness in their faces. The beauty and estrangement of the perfectionist is the priority, and these are really the only moments where emotions are given center stage. There is some minor drama at the end of the film, and you’ll miss it if you are not paying attention. To offer a tease, it involves just whose sushi it was who wowed the Michelin judges when they awarded Jiro those coveted three stars, and why. Jiro Dreams of Sushi is a subtle meditation on art and the price it exacts from those who would seek its peaks, in the fascinating context of the sushi world. It is also an opaque but riveting study of people who strive for glory in the simple gestures of good food, clean spaces and loyalty. Our City Dreams Really Can Come True, Right? Posted in Side Shots Film Blog and tagged DVD Reviews, Food, Jiro Dreams of Sushi. Bookmark the permalink. Trackbacks are closed, but you can post a comment.